Greetings, internet. I last published a post on this weblog 1,125 days ago. A hundred and twelve generations of fruit flies have flourished and expired in that time. I’m breaking the silence here only to officially announce the death of this blog. I’m mothballing this sucker and will make no further updates. The blog will remain hosted here and all the links still active, permanently archived for posterity. But I won’t be posting here again after these final words. At some point in the future I expect I’ll launch a fresh blog somewhere, but the geek subdomain is going read-only tonight. Both of you can unsubscribe your RSS readers now. Meanwhile, if you’re really interested, there’s Twitter (frequently updated) and Tumblr (infrequently updated) and Flickr (semi-regularly, if sporadically, updated). I signed up for Flickr a little over four years ago. While I was going through the initial setup and exploratory tinkerings, I was presented with the opportunity to change my profile avatar from the default gray block to something a little more personal. I couldn’t think of anything original offhand, but I happened to have a picture of Blinky — the three-eyed mutant fish from the Simpsons — laying around on my hard drive, so I uploaded it with every intention of eventually switching to something more my own. After that first-time setup, my Flickr account was left unused for several months. I didn’t own a decent digital camera at the time, and had no contacts with whom to share pictures anyway. I mostly ignored Flickr, though it stayed at the back of my mind in a “one of these days I’ll have to do something with that” kind of way. Then, in March of 2005, I went to my first SXSW Interactive conference. This became my excuse to finally buy a camera and start photographically documenting some more of my life. My very first upload was a picture of my luggage tossed casually in a chair in my hotel room on the night I arrived in Austin. I added a tag and some notes and created a photoset for my one photo. But I hadn’t gotten around to changing my avatar, and still couldn’t think of anything original. So the fish stayed. That first SXSW was — to abuse a cliché — a life-changing experience. I met a slew of my personal heroes whom I soon came to regard as friends and colleagues. Suddenly I had contacts attached my Flickr account, and the network started to grow. I was tagging and faving and commenting on people’s photos just as they commented on mine. And all with a little picture of a three-eyed fish next to my name, because I still hadn’t gotten around to changing it. Over the next few years I joined up with more social networking sites. I still had no personal brand to speak of, so each new profile defaulted to using Blinky as an avatar. In time, that little mutant became familiar and even recognized to the point that more than one person has failed to remember my name or my website, but remembered that “oh, you’re the guy with the fish.” And so, as they say, it stuck. Now the Blinky avatar is permanently attached to whatever semblance of an online identity I have. I use it on Flickr, Twitter, Last.fm, Dopplr, Ma.gnolia, Pownce, Upcoming, and even Facebook (though I abhor Facebook and don’t really use it). But Blinky really came into his own when I started customizing him with different looks and outfits for various occasions, beginning a new tradition that I’m now obliged to continue until it stops being funny. 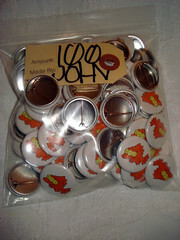 On a lark, I ordered a small batch of 1 inch Blinky badges for SXSW08. They proved quite popular, much to my surprise. So the story behind the Blinky avatar is… there is no story. It was a completely random and meaningless image that, through consistency and repetition, has gradually taken on meaning. Blinky has become part of my residual self image. So if, when next you jack into the Matrix, you happen across a goofy, three-eyed cartoon fish swimming about making dweeby sci-fi references and griping about sloppy markup, it’s probably me. Feel free to say hi.